"COMFORT AIRE" DEHUMIDIFIER 65 pint 115V 830 watts 7.8 amps Dimensions: 21-1/4"x 15-5/32" x 13-3/8" LED display Touchpad control Electronic control Auto restart Auto humidistat control 2 fan speeds Airflow 131/120 cfm Unique design to flush wall Low noise operation Top air discharge Bucket capacity 22 pints Automatic full bucket shut off Front access bucket with hand hold Auto defrost control "Energy Star" qualified Actual v. set humidity/temp. read out Low temp operation (to 42 degrees F) Washable filter 4 casters Boxed. 65 pint, 115V, 830 watts, 7.8 amps, Dimensions: 21-1/4"x 15-5/32" x 13-3/8"
This dehumidifier was installed about one month ago in a very very damp and mildewy basement with lots of odors. In one week the odors were gone, and the basement is back to it's old self. The only drawback is that we suspend the unit from joists in the ceiling, so the controls cannot be seen or adjusted unless one stands on a two foot step stool. I have been using this dehumidifier for approximately one month in my home, an earth sheltered contruction, with two thirds of the living space totally underground. The appliance runs in a central location of the living space. 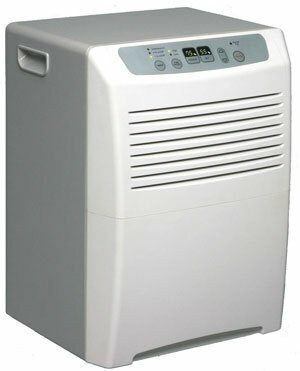 Our need for dehumidification is a fact of holding moisture that is produced by showers, laundry, cooking, etc. The submerged walls are entirely coated with rubber to prevent moisture entering from the exterior. The first thing I noticed was that it ran rather loudly and I would like it much better if it were more quiet. Even the hi and lo settings on the fan do not make much difference in the sound. I have tried it on every variation of every cycle and it seems to shut off and start back up again sometimes when it is indicating a 2 or 4 hour continuous run cycle. When it is on continous run (no indicator light for 2 or 4 hour run times) it shuts off when it reaches the humidistat setting, but turns back on within three or four minutes as the humidistat is recording rapidly rising humidity. I am assuming that the humidistat sensor is too close to the water container and I cannot use a drain option in my home which would keep the water always running away. I cannot even try it this way, so I don't know if it would work better or not. With the constant off and on and the level of noise, I often find myself turning it off at night as it is difficult to fall asleep when it is doing that. It is very efficient at taking out moisture and our local weather has been dry, so I've had to turn it off for a period of time occasionally. I fear with the constant running, we are using more electricity than necessary.